PRESIDENT Emmerson Mnangagwa has cut short his international re-engagements efforts in Europe and will return home today to attend to the economic situation in the country in the wake of violent protests organised by the Zimbabwe Congress of Trade Unions and civic society groups aligned to the opposition Movement for Democratic Change. 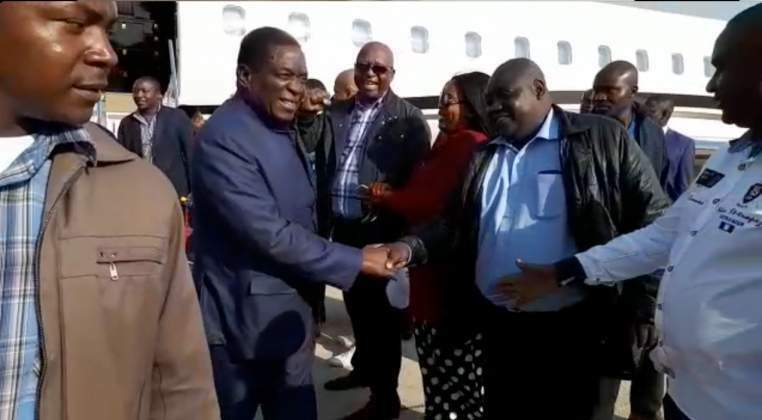 President Mnangagwa was today expected in Davos, Switzerland to attend the World Economic Forum Annual Meeting 2019 which kicks off tomorrow after a highly successful four-nation tour of Russia, Belarus, Kazakhstan and Azerbaijan. The President signed mega deals in Russia and Belarus while forging new economic ties with Kazakhstan and Azerbaijan. He was among world leaders expected to attend the WEF in Davos where he would have seized the opportunity to market Zimbabwe internationally and its vision of becoming a middle income economy by 2030. The meeting, whose theme is "Globalisation 4.0: Shaping a Global Architecture in the Age of the Fourth Industrial Revolution," will this year be held from January 22 to 25. More than 60 Heads of State and Government, and foreign news organisations requested to meet President Mnangagwa at last year's World Economic Forum. This was President Mnangagwa's maiden international business engagement since he took office on November 24, 2018, with his public policies strongly biased towards quick economic recovery winning him worldwide attention. But the President has this time around prioritised pressing issues back home and will not be attending this year's meeting. Zimbabwe will be represented by the Minister of Finance and Economic Development, Professor Mthuli Ncube. In a Twitter message last night, President Mnangagwa said: "In light of the economic situation, I will be returning home after a highly productive week of bilateral trade and investment meetings. We will be ably represented in Davos by the Minister of Finance, Mthuli Ncube. The first priority is to get Zimbabwe calm, stable and working again". Zimbabwe was rocked by violent protests on Monday and Tuesday last week characterised by wanton destruction of property, looting and burning of shops, closure of schools and industry. The terror attacks also claimed four lives including that of a police officer from Entumbane in Bulawayo who was stoned to death by marauding gangs of youths. Normalcy has returned to Harare and Bulawayo — the epicentres of the protests with Government imploring workers to return to work today while schools have been urged to open for normal business.